Incumbent Andrew Cuomo, incumbent Kathy Hochul and Letitia James will be the Democratic nominees for governor, lieutenant governor and attorney general — two of whom are candidates that took Broome County by more than 15 percentage points. Thursday’s state and local primary in New York came at the end of a fiercely contested primary season for the state’s Democratic Party, with Cynthia Nixon and Cuomo vying for the gubernatorial nomination. In the lieutenant governor’s race, Hochul faced Jumaane Williams, while the attorney general’s election was a four-way race between James, Zephyr Teachout, Sean Patrick Maloney and Leecia Eve. All Republican candidates in statewide races are running unopposed. Across Broome County, approximately 10,000 people voted in the election, and on campus, 128 students turned out to vote. The numbers are a sharp incline from the last midterm primary election in 2014, when only eight students voted on campus and about 4,000 residents voted in the county for the Democratic primary. In Broome County, Cuomo won the election with 57.55 percent of the vote, Hochul with 60.48 percent and Maloney with 43.78 percent. Cuomo and Hochul secured the nominations over their opponents by substantial margins in the county, while Teachout trailed Maloney by roughly eight percentage points. In the 2014 Democratic primary, Cuomo won Broome County with 50.8 percent of the vote. Students voting on Binghamton University’s campus, which is represented by Vestal electoral districts 11, 12 and 13, elected Cuomo with 70.31 percent of the vote. In other races, however, the student population strayed from the county’s overall vote, with Maloney only receiving 16.51 percent and Hochul losing to Williams on campus. In the attorney general’s race, Teachout received the most students votes, followed by James. Across the state, however, the results were slightly different. 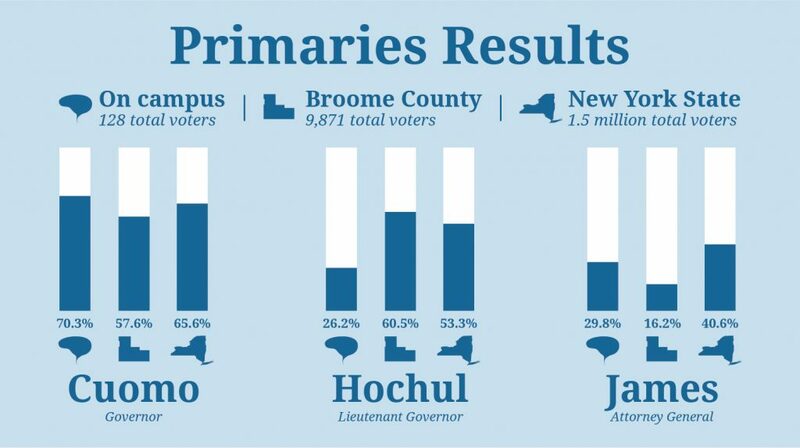 Although the lieutenant governor’s race was decided by a fairly broad margin in Broome County, it was somewhat tight statewide, with Hochul securing the nomination over Williams by just over five percentage points. In the attorney general’s race, James, rather than Maloney, took the state with approximately 41 percent of the vote. Among Broome County voters, she received approximately 1,500 votes — just 16.15 percent. Maloney led the race in most of western New York, with Teachout seeing popularity in the eastern portion of the state and James securing victories in New York City and Long Island. Although voters elected nominees for state and local positions, New York’s federal candidates were decided in a separate primary in June. It is the only state in the country to hold separate federal and state primaries. Now, Cuomo, Hochul and James will face Republican and third-party candidates in the general election. Marc Molinaro, the Republican nominee for governor, will be Cuomo’s main adversary. He will also face challenges from independent candidate Stephanie Miner, Libertarian candidate Larry Sharpe and Green Party candidate Howie Hawkins.